A bite-sized lamb meatball with apricot, turmeric and fennel in a sticky tamarind sauce, topped with sesame seeds. Just add a cocktail stick to make the lollipop! Our chefs mince leg of lamb and add dried apricots, fennel seeds, onions, spices, dill and chilli flakes. Then the mixture is rolled into meatballs and cooked. The sticky sauce is made from tamarind paste, light brown soft sugar, fish sauce and sesame seeds. Lamb (31%), Light Brown Sugar, Dried Apricots (18%) (contain: Preservative: Sulphur Dioxide), Tamarind Paste (7%), Thai Fish Sauce (contains: Water, Anchovy Fish Extract, Salt, Sugar), Free Range Pasteurised Whole Egg, Onions, Cornflour, Rapeseed Oil, Sesame Seeds, Water,Turmeric, Dill, Ground Ginger [Sulphites], Ground Cinnamon, Ground Fennel, Salt, Chilli Flakes. Preheat oven. Remove sleeve and film. Leave the canapés in the tray and place on a baking tray in the centre of the oven. 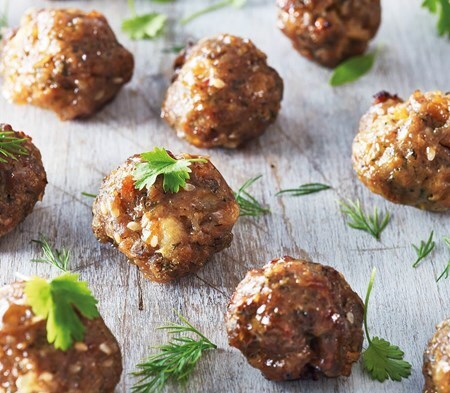 To give your lamb kofta lollies some pop (and to keep fingers clean) just add a cocktail stick before serving. Allow to rest for 2 mins before serving. When cooking more than one pack of canapés at a time, allow extra cooking time.